Anyone elses still just say 'Coming Soon'. I'm a student and am using my uni email. How do you know it's 1000 points when it's just sitting on coming soon? Used to get a free drink on download of the app for the first time, this is a crap offer. Anyone tried using a flask instead of a cup? You're right. Your comment gets a "golden" like from me. Not really but I guess we all have our own opinions on things. It is a reward program, just like any other, why does it matter if you are collecting air miles or cookie stamps. If you already have the app and have stamps on it then I’m assuming you cannot use this n taking a risk to delete the app and reinstall and might loose all stamps already collected? Can anyone advise about this? Thank you. For some reason the two codes above worked even though I had used them before. I got one today; scanned the Nero app for stamps and paid using O2 Priority code, the VIP Coffee Pass then appeared in my app straightaway. I've also been gone from Caffe Nero for less than a month. I wouldn't have known to look out for it if I hadn't seen this post though and would probably have missed its appearance, so thanks! That's when I got it yes. 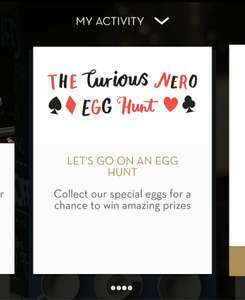 I am not sure if it's a 2019 new year free coffee now, rather it's one you'll randomly get at some point if you use the Nero app. Is this after you scan the Nero App ? 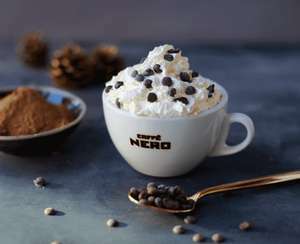 Get 10% back every time in Caffe Nero using Amex nectar car. Not sure if it is account specific, thought worth saving. Thank you for the post, saved to my card. This one appeared a few weeks back I believe. I have one card with 10% off, another with 5% on purchases over £7 as someone else has had. Which to use (lol) ?! Good idea to purchase a gift-card to maximise the use over time. Not on mine. Just the usual 5% back when spening £7 or more. Maybe i'm missing something but what is the full code ?? Anyone help ?? Bozo by name..... You can fill in the rest. Literally. PLEASE read what I said, I did not say you didn't.! No problem, here you go... Nought. Scatter thee sandwich I cheated on the last word for comic effect. I am stating this so as to not risk offence. Caffè Nero - Bring your own cup, get 3 stamps! I agree with the contacting Nero to let them know about the glitch was "not cool" - but to post a deal on a glitch which they would likely resolve is, in my opinion, is fine as I was just encouraging others to maximise the benefit. I mean it's an extra stamp not a massive saving. If you really wanted you could use the other deal of creating a new account and get a new drink which is better than this extra stamp. They've all gone today, will they be restocked tomorrow? Oh. I've only been an 02 customer a few months but I've had 2 free drinks a week until today. Last week I had a code on both Tuesday and Wednesday. Yesterday (Tuesday I used my code) but today it just kept saying my code had already been used (I haven't had a drink from Nero today) . It was the same for the 2 people in front of me. Have o2 changed this offer to now only one free drink a week? Valid untill the 9th. Thank you OP, used the offer with Amex 10% off. 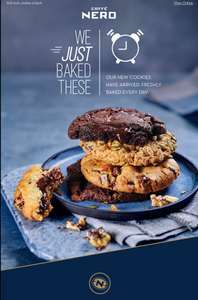 16% discount on nero giftcards through my work. Whats the odds of buying this giftcard with giftcard topped up through my work? Late November / early December. how long does this offer normally last for ? In one store, they didn't know about it. In another, there was a board clearly advertising it. I bought, checked the balance online and the bonus amount was there. Nero has this almost every November and I wait to combine it with Halifax / Amex cashback. It's back again can't see a thread on it. As in take a photo of it? I have found them to be sold out too! I see it as something for free so hardly worth getting upset abpjt. Its valid for the whole 2 days whichever day you do it. Always has been. When it was only Tuesdays it wqs always valid all Tuesday. Branch open until 11pm in Manchester (picc station) so very handy! Thanks, didn’t know that would work! Just a point worth mentioning, the paper stamp cards last indefinitely, the stamps collected on the App are only valid for 12 months (pretty sure). I transferred my nine stamped cards to the Nero application and before i left i had 18 cards. I had 3 cards with 4 stamps on each so I got the double up promo that ran during October for adding stamps from cards to the app. Can you use this on Xmas drinks? I claimed my first free drink in store, and as soon as I scanned it, my 2nd free drink disappeared from the app!!! Anyone else experienced this? Why isn't this expired? It doesn't work. Voted hot. I get free coffee every week. Can I be the Mrs?